La Guardia Airport (LGA), one of three major aviation facilities serving New York City, is getting a much-needed overhaul. Governor Andrew Cuomo, alongside Vice President Joe Biden, announced today a massive plan to completely redesign the airport. For anyone who has suffered, I mean traveled through LaGuardia, this is great news. Having ranked #1 on Gizmodo’s 2014 list of “The Worst Airports In America” and 10th on The Guide to Sleeping In Airport’s 2014 list of the worst airports in the world, La Guardia is clearly long overdue for an update. The current buildings are overcrowded, have low ceilings, long security lines, poor restaurant selections and are sorely outdated for the needs of the 21st century. Basically, the whole place is old and busted. LaGuardia’s current layout (shown on the map above) consists of many disjointed terminals that make passenger connections—and the overall passenger experience—confusing and inefficient. With today’s announcement, the old layout will be completely replaced with a single combined terminal building. The entire airport is also slated to move approximately 600 feet closer to the Grand Central Parkway, which will free up additional space for flight operations. Because of its cramped geographical situation with runways protruding into the water, the airport has earned the nickname “USS LaGuardia” among pilots, who liken the approaches to that of an aircraft carrier. The project will be completed in phases, the first of which is slated to take 18 months and cost upwards of $4 billion. The teardown will begin in 2016 and is expected to create 8,000 jobs. Delta Airlines, which has a hub at LaGuardia, was named as a partner in the project. Governor Cuomo noted that half of the money for the first phase of construction will come from private sources. LaGuardia’s new layout will also offer travelers more convenient connections to ferries and rail service. A new Marine Air Terminal will facilitate transfers from the airport to other destinations in the city by water. 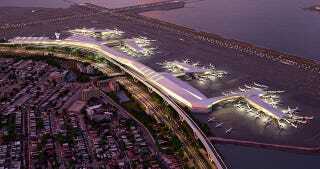 John F. Kennedy International Airport (JFK) will also receive an infusion of capital spending, including a new hotel. Last week, the Port Authority of New York and New Jersey also approved $40 million towards upgrading Newark’s (EWR) vastly outdated Terminal A. Altogether, these construction projects seem to represent represent a great pivot forward for New Yorkers and visitors to the city. With any luck, La Guardia will no longer be such a depressing and disgusting welcome center to a city billed as the greatest in the world.